It’s just a wisp of a book but an odd wisp at that. 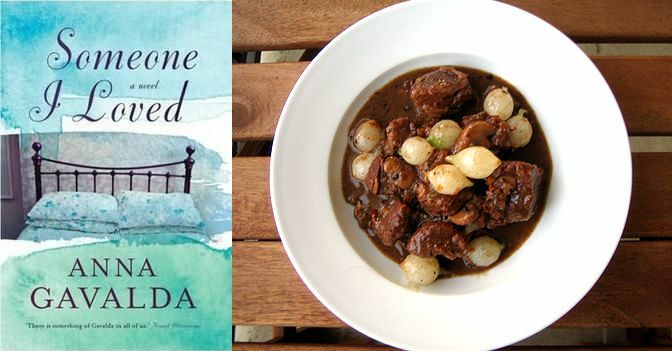 Someone I Loved by French author, Anna Gavalda, is the story of Chloé, whose husband suddenly leaves her and their two daughters for another woman. Unexpectedly, her usually cold and distant father-in-law, Pierre, comes to her aid, sharing what he has learned about life and love. Interestingly, the book is subtitled ‘A Novel’. Hmmm – that made me wonder. Did the publishers add that because at just short of 160 pages, it’s straying into ‘novella’ territory – what are the official guidelines, anyway? Or did they add ‘A Novel’ because everyone in Gavalda’s home country knows all about her private life and assumes that she has written all about herself. I couldn’t help myself – took a quick peek at Google. Seems my thoughts were not far off the mark. The book was written after Gavalda’s marriage failed and the publication of Someone I Loved in 2002 was followed by the 600 page doorstop, Hunting and Gathering in 2004 – take that, anyone who mentioned ‘lightweight’! So, to the book. The majority of the text is dialogue. Little of the back-story is given but it’s not necessary – you pick up what you need to know from Pierre and Chloé’s conversations. Gavalda’s dialogue is well written – it stops and starts as real conversations do and despite not knowing much about the characters, their language tells you a lot. I’m sure that while this all looks simple on the page, writing dialogue like that in Someone I Loved is difficult to achieve. Is the father-in-law cracking onto the woman his son has just abandoned? If so, ewwwwww. Perhaps I’m I over-reacting? But honestly, I’d have a fit if my father-in-law ever said anything like that to me (which he wouldn’t). As Pierre begins to share his thoughts about life with Chloé, there are many more of these odd little remarks. And herein lies the difficulty – if Pierre has always been cold, distant and aloof, suddenly singing his daughter-in-laws praises and saying that she deserves to be treated a princess just doesn’t seem a likely scenario – regardless how much wine they’d drunk. There’s a major element of Pierre’s story that I’m leaving out of this review because I think it constitutes a spoiler (others on Goodreads don’t agree – if you’re desperate to know what happens, read a few reviews on Goodreads). Again, I question the likliehood of Pierre revealing this information to Chloé – does he do it to somehow excuse his son’s behaviour? Does he do it to imply that Chloé has another chance at love? Whatever the motivation, this part of the story delivers the best bit of writing – a letter that Pierre receives from a friend. The letter is a rambling list of things that people in love should do – it was poetic in its ordinariness. 2.5/5 Ultimately I didn’t believe the banter. Despite the fact that Chloé and Pierre talk over dinner, you don’t actually know what they eat! I suspect it’s a casserole of some kind. A lot of wine is also drunk. So of course, Boeuf Bourguignon (Beef Burgundy). Thanks for sharing your thoughts on this book! I loved Hunting and Gathering when I read it years ago but have yet to check out her other books. I got a sample of Hunting & Gathering – it had great reviews so I may check it out for my Translated Reading Challenge.